SIPTU HAS SAID that its members will go ahead with planned industrial action at airports in Dublin, Cork and Shannon on Monday despite a plea from the Transport Minister Leo Varadkar to resolve their dispute with authorities. 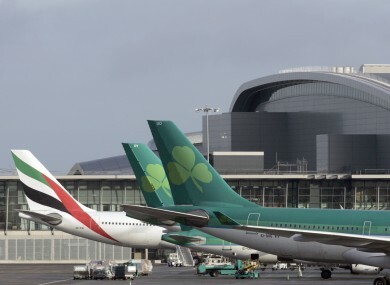 Members of the union plan rolling two-hour stoppages next Monday over a dispute with Aer Lingus and the Dublin Airport Authority which will attempt to get a High Court injunction preventing the industrial action this Friday. The dispute centres on the funding of the Irish Aviation Pensions Scheme which has a deficit of €700 million. Earlier today, Varadkar called on all stakeholders in the pensions scheme to renew their efforts to reach an agreement and avoid the planned industrial action next week. In a statement the Department of Transport said: “Minister Varadkar, who has been in regular contact with the stakeholders, said he is encouraging them to use the State machinery to resolve the current difficulties regarding the pension scheme. But SIPTU said in a statement this evening that they intended to press ahead with their planned strikes next week saying there was “was ‘anger and dismay’ among members over the threats, legal and otherwise, that have been made by the employers over recent days”. In a statement, sector organiser Dermot O’Loughlin said that proposals on resolving a dispute had not materialised and that industrial action will proceed as planned. He said: “Both companies have, for many years, paid significantly low contributions into the pension fund. Now they have abandoned their responsibilities to thousands of our members by refusing to put the required extra monies into the scheme. A meeting of the industrial action committees of SIPTU, Aer Lingus and the DAA is planned for tomorrow morning. Email “Minister to airport workers: Don't go on strike. Union: We're going on strike”. Feedback on “Minister to airport workers: Don't go on strike. Union: We're going on strike”.